Do you know anyone who actually is excited about the prospect of going home in the dark after work? 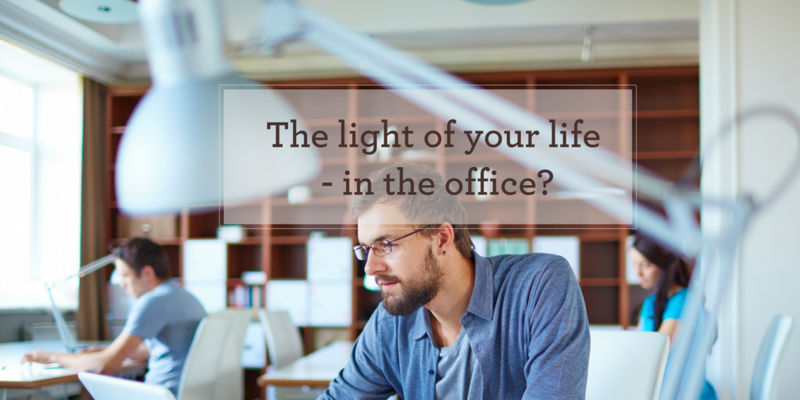 In this blog we look at how lighting at work can actually help your mood. Certainly our biorhythms change and we have to adjust our lifestyle to suit darker days. Besides dreaming of exotic holidays what can we do to help our mood during the winter months, especially in the workplace? We spend our working days usually in an office and anyone who has ever worked in a dingy office will confirm how it makes him or her feel, and we all know to what extent natural daylight boosts our mood. A new study by LUX365 has confirmed what we may already have been able to deduce – that better office lighting, which mimics natural light, improves people’s mood and therefore boosts work productivity. UK workplace productivity has been steadily falling for the last seven years. However, with each winter, it’s set to fall again. This can be partly attributed to the clocks going back which means that whilst it’s lighter earlier on, it tends to be dark for the last couple of hours in the office. On rainy days it can appear to get dark as early as 3pm! As a result offices have to rely on artificial light to light up workspaces. Whilst we know it’s the 21st century, our subconscious doesn’t, and it uses natural light to help regulate our mood, feelings and energy. Working in dimly lit rooms can upset our internal rhythms and cause low mood and low productivity. Furthermore, whilst bright light can help us feel less tense and livelier, blue lighting can affect our hormones and induce stress. In the UK, over 16 days are lost, per worker, per year on average, due to workplace induced stress, illness or injury. With 1 in 5 people in UK suffering from SAD (Seasonal Affective Disorder), we can deduce that some of these missed hours of work may be attributable to low moods caused by lack of sunlight. What do the States of Jersey say? The States of Jersey have published:Health and Safety in the Workplace: A general Guide. The guide provides a brief explanation of the legal framework for health and safety in Jersey and goes on to provide advice on a range of health and safety topics. LED lights can replicate natural lighting much better, and it’s advised that offices should seek out LED lighting to replace the use of artificial lighting such as strip lights, in order to illuminate workplaces during the dark parts of the winter day. Even better are custom built and self-operated LED lighting systems, especially in open plan offices. As you can see, it’s important for employers to consider the lighting used in workplaces, both for the health and wellbeing of staff, but also for the effect this has on their productivity. When lighting is needed to replace daylight, then LED, over other sources of artificial lighting, is advised. Employers are not legally obliged it seems to provide any kind of specific lighting. With considerable benefits from LED lights some organisations may want to look into this kind of alternative, the result could be a happier and more productive workforce!